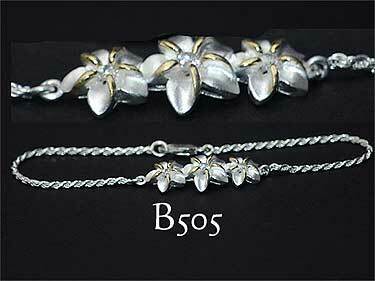 Sterling Silver Triple Hawaiian Plumeria (frangipani) Bracelet. Features three frosted finish flowers, each with 14k gold plate highlights and central sparkling clear cubic zirconia. Either side is diamond cut rope chain. Secured with a strong lobster clasp. Measurements: Centre flower is 12mm diameter, other two are 10mm diameter. Total bracelet length of 7.25 inches (184mm).